The active ingredient in Perio Gel is hydrogen peroxide. It occurs naturally in the body and is also a powerful antimicrobial. Hydrogen peroxide penetrates the protective slime layer covering bacterial communities, and it can break down the cell walls of bacteria causing infections and oral wounds associated with gum diseases like gingivitis and periodontitis. These infections and oral wounds are hard to see because they are hidden below the gum tissue. Getting medication under the gums and keeping it there long enough to work can be a challenge. 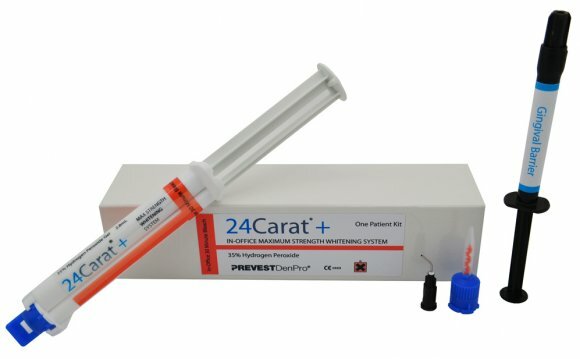 Research shows that a customized prescription Perio Tray can deliver and maintain Perio Gel below the gum tissue long enough for the hydrogen peroxide to do its work. The Perio Tray is specifically designed to place medication in the periodontal pocket, the space between tooth and gum tissues that harbors infections. The Perio Tray is truly unique, fabricated with a seal system customized for each tooth according to patient conditions. The seal prevents leakage and directs the medication in the pocket. A common side effect of Perio Gel usage in prescription trays is gradual tooth whitening. Patients who have anterior restorations (for example crowns in front teeth) should talk with their doctors/dentists. The 1.7% concentration of hydrogen peroxide in Perio Gel is much lower than professional whitening products, so whitening effects will not be immediately noticed, but with consistent usage gives you a whiter, brighter smile. With any treatment for home use, it is important to follow the schedule prescribed by your doctor/dentist. Periodontal disease is never cured. Bacterial communities underlying the disease can begin to reform within days. The most advanced stage of bacterial growth involves clumps of bacteria detaching from the original community to form new infections. Most people don’t even know they have a problem because the infections are hidden from view. Left unchecked, gum disease can lead to bad breath, bleeding gums, and tooth loss. Professional dental cleanings are important to remove bacterial communities causing the disease, but additional care is often recommended to help manage bacterial regrowth. Research shows that when professional cleanings are combined with Perio Tray delivery of Perio Gel, the results are significantly better. Once you have the disease under control, it is important to continue with maintenance treatment as prescribed by your doctor/dentist. Keeping oral bacteria in check can protect you from the disease recurrence. Store Perio Gel away from sunlight at room temperature (do not freeze or refrigerate). For better control dispensing the gel, snip the end tip of the tube. Infections in gum tissue may provide a doorway for bacteria to enter the body and contribute to other health concerns, so it is especially important to take gum disease seriously. With treatment and a good maintenance program, most patients are able to prevent additional tissue damage. Bacterial communities regenerate quickly in the mouth. Keeping oral bacteria under control is key to helping prevent disease recurrence. Be sure to talk to your doctor/dentist about any concerns you have.